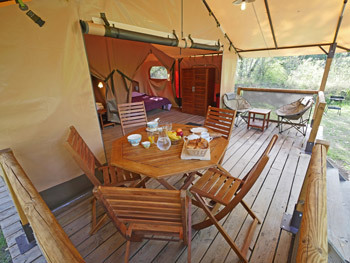 Next to this tent you can enjoy its large sheltered wooden terrace. 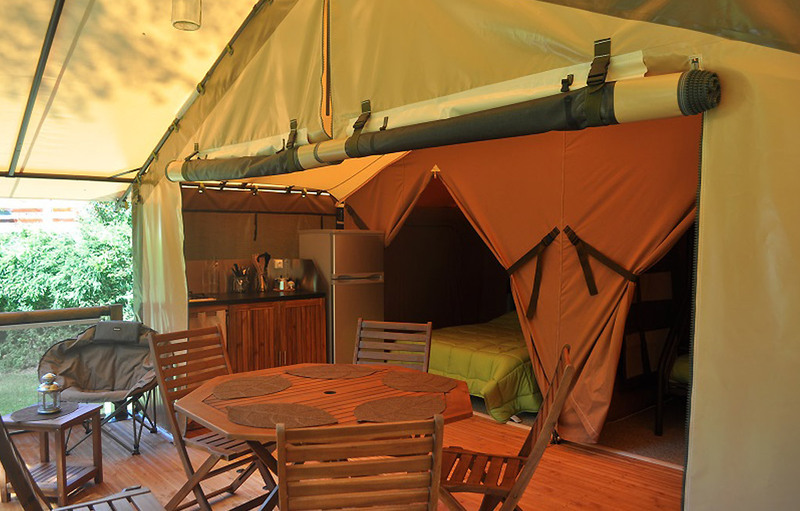 We rent tents per week, from Saturday (4 pm) until Saturday (10 pm). 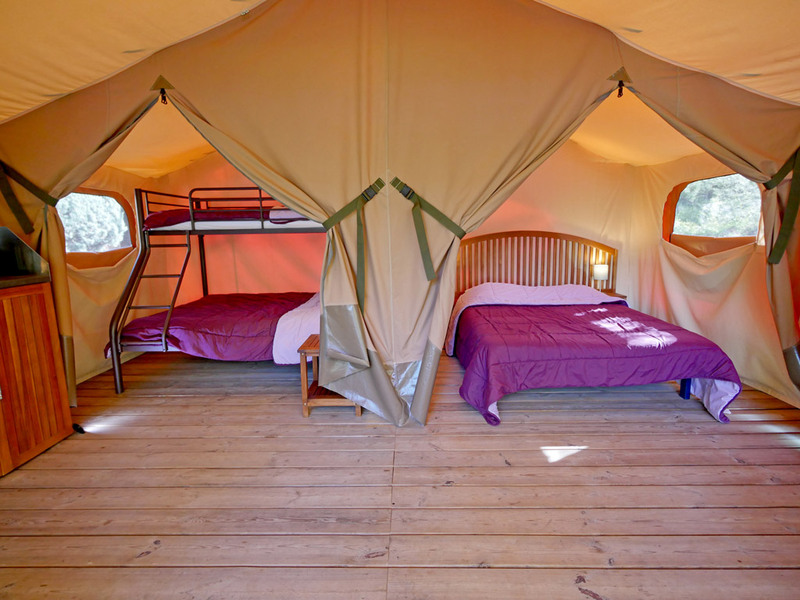 In May, June and September, you can rent a tent for a shorter period (minimum 3 nights. Every tent has an terrace with a table, chairs, refrigerator, microwave, electric coffeemachine, two gas elements, a kitchen cart (with dishes, plates, bowls, pots and pans, forks, knifes, spoons, mugs etc.) and an extra cupboard (empty) for your own belongings. 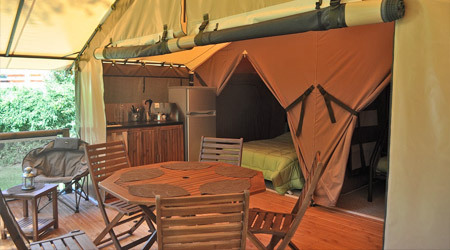 Cushions and blankets are provided inside our tent. You can rent sheets, towels and kitchen towels, please select the option on your reservation form. We do not offer washing facilities nor toilets inside the tents. Our tents are not connected to the drainage system. 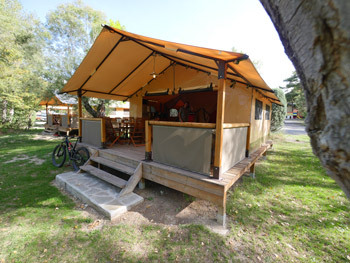 You are invited to use the shower blocks on the campsite, not far from the caravans. You can put an extra (small) tent on your plot for children without extra fees. 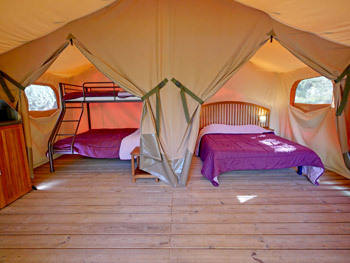 You are kindly asked to leave the tent cleaned up after your stay. Reduction of 10 % for reservations of 3 weeks or more. We rent caravans per week, from Saturday (4 pm) until Saturday (10 pm). 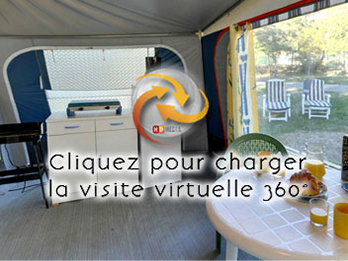 In May, June and September, you can rent a caravan for a shorter period (minimum 3 nights. 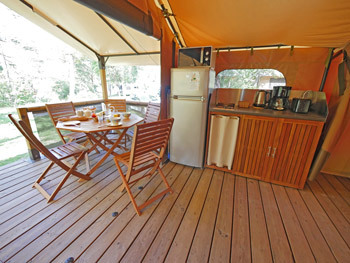 We rent caravans for 4 or maximum 6 people. 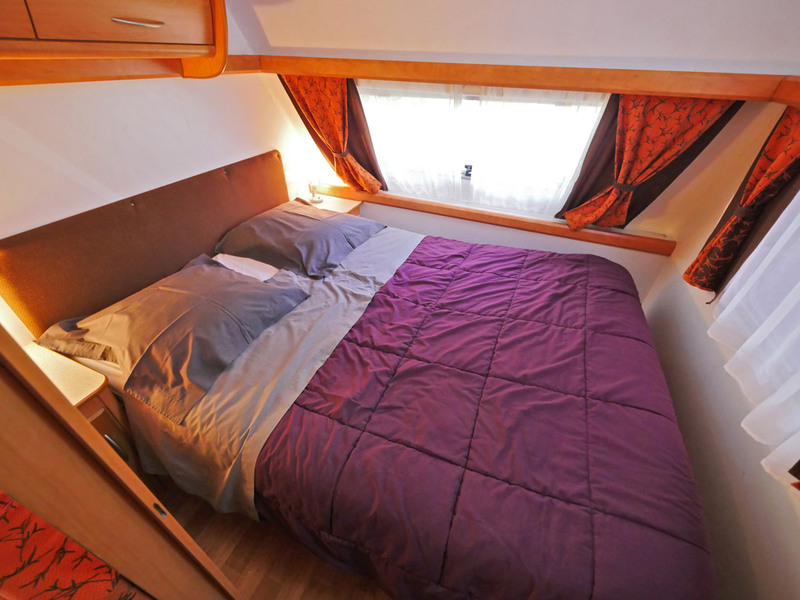 The caravans with 4 places have one double bed for two people in a bedroom you can close with a door and a dinner corner that you can transform into a second double bed. The caravans with 6 places have one double bed for two people in a bedroom you can close with a door, a dinner corner that you can transform into a second double bed and bunk beds (suitable for 2 persons, children or adults - long mattresses). 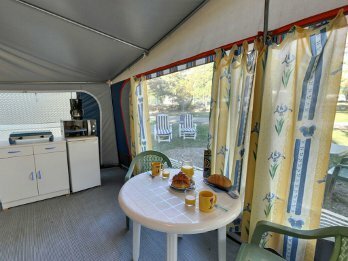 Every caravan has an awning with a table, chairs, refrigerator, microwave, electric coffeemachine, two gas elements, a kitchen cart (with dishes, plates, bowls, pots and pans, forks, knifes, spoons, mugs etc.) and an extra cupboard (empty) for your own belongings. 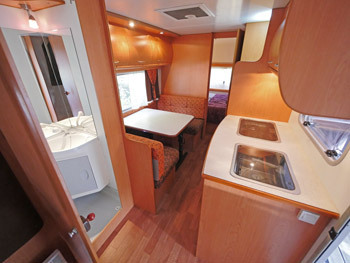 Cushions and blankets are provided inside our caravans. You can rent sheets, towels and kitchen towels, please select the option on your reservation form. We do not offer washing facilities nor toilets inside the caravans. Our caravans are not connected to the drainage system. 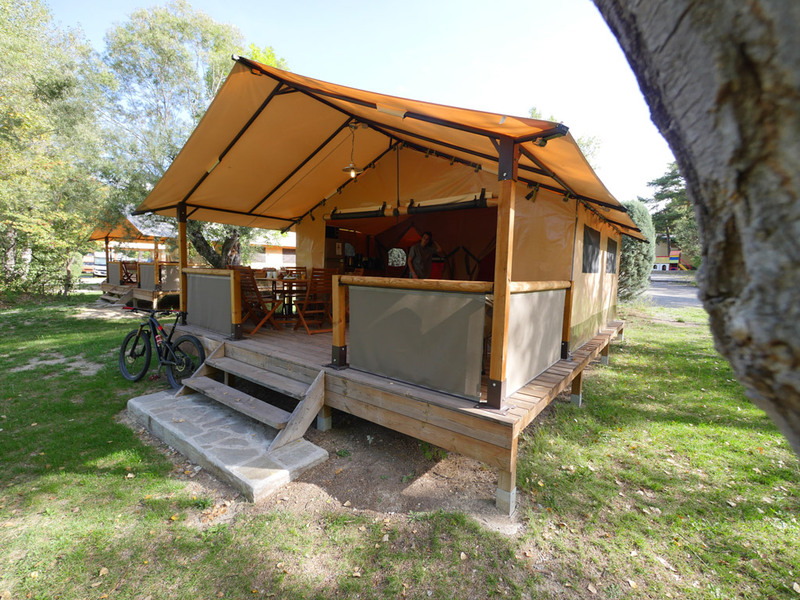 You are invited to use the shower blocks on the campsite, not far from the caravans. You are kindly asked to leave the caravan cleaned up after your stay. The prices are in euros, VAT, showers and tourist taxes are included. 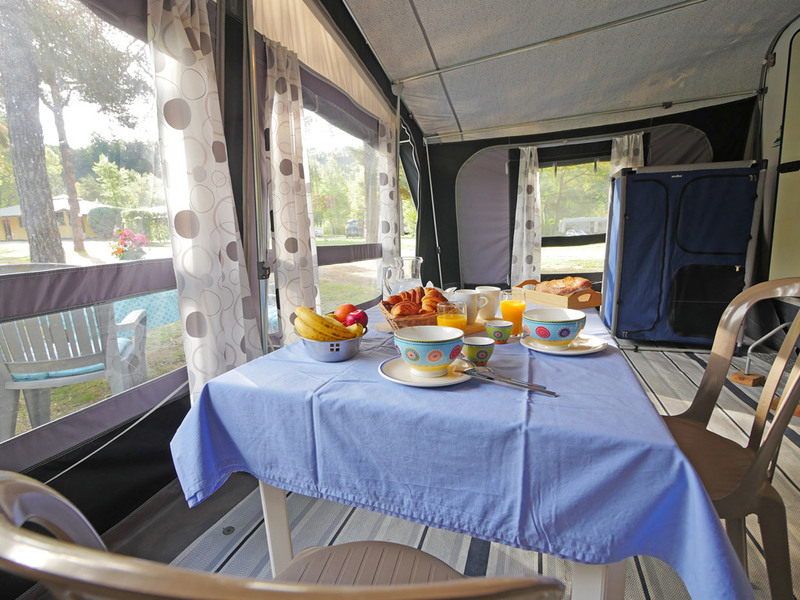 How to reserve: Please contact us by email in order to make sure we have a caravan left during your holidays, then fill in the reservation form you find below and send it to us by email or by post.